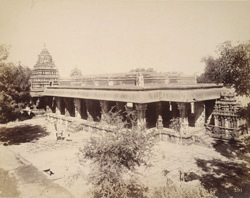 Photograph of the Venkataramana Temple at Tadpatri, Anantapur District, taken from the Archaeological Survey of India Collections: Madras, 1896-98. This complex was built during the Vijayanagara period in the mid-16th century. It is entered through a tall gopura in the middle of the east side of a rectangular colonnade. The main shrine, dedicated to Vishnu, is preceded by a closed mandapa with two porches. This view is taken from an elevated position, looking down onto the mahamandapa or main hall, with the main shrine at the left and the stone car at the right. The columns of the open mandapa have shafts decorated with rearing beast (yalis) and figures of female devotees. The stone chariot is a miniature temple dedicated to Garuda. It has a pyramidal roof and pilastered walls. The stone wheels are carved with lotus motifs.